If you work and play in the world of heavy-duty towing, you know what it means to push your truck to its working limits. CURT allows you to take full advantage of your truck’s towing capabilities, giving you the power to tow gooseneck trailers and fifth wheel trailers interchangeably. We offer two fifth wheel adapter products to enable this ability: X5 fifth wheel adapter plates and fifth wheel rail gooseneck hitches. 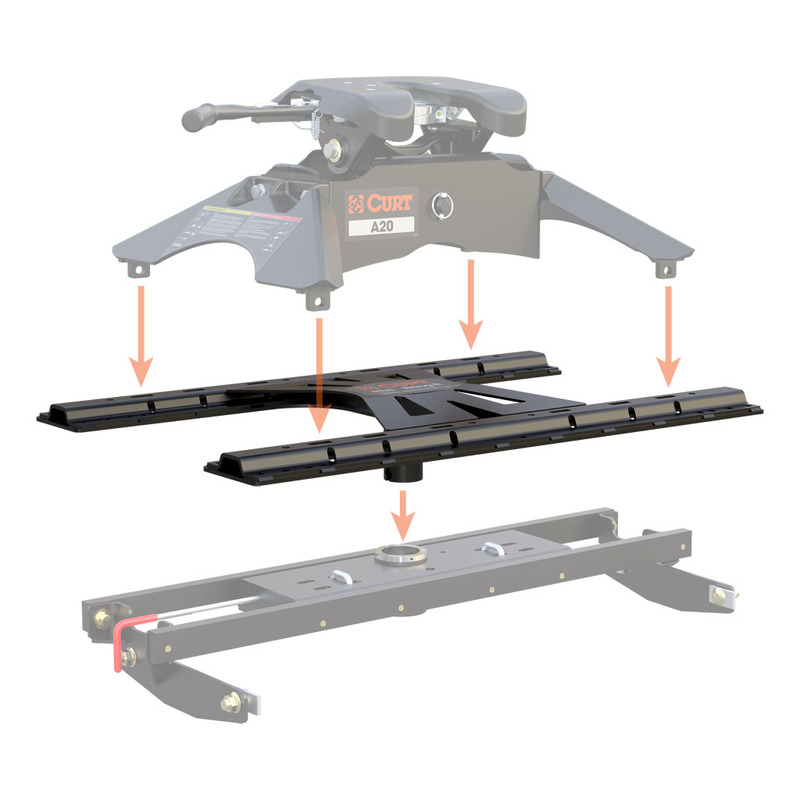 CURT fifth wheel adapter plates transform a gooseneck hitch into a set of industry-standard fifth wheel base rails to mount a fifth wheel hitch. Our X5 fifth wheel adapters are available with a round or square shank to fit three different gooseneck hitches: the CURT Double Lock EZr™, the original Double Lock and the B&W Turnoverball* gooseneck hitch (does not work with shallow models). CURT fifth wheel gooseneck adapter plates feature industry-standard fifth wheel base rails that provide mounting points to fit any CURT fifth wheel hitch or and competitor fifth wheel hitch with industry-standard mounting points (limited to lowest rated towing component). They can accept fifth wheel rollers or fifth wheel legs (except OEM puck system products) and feature an impressive towing capacity of 20,000 lbs. to accommodate most deluxe campers, RVs and other fifth wheel trailers. 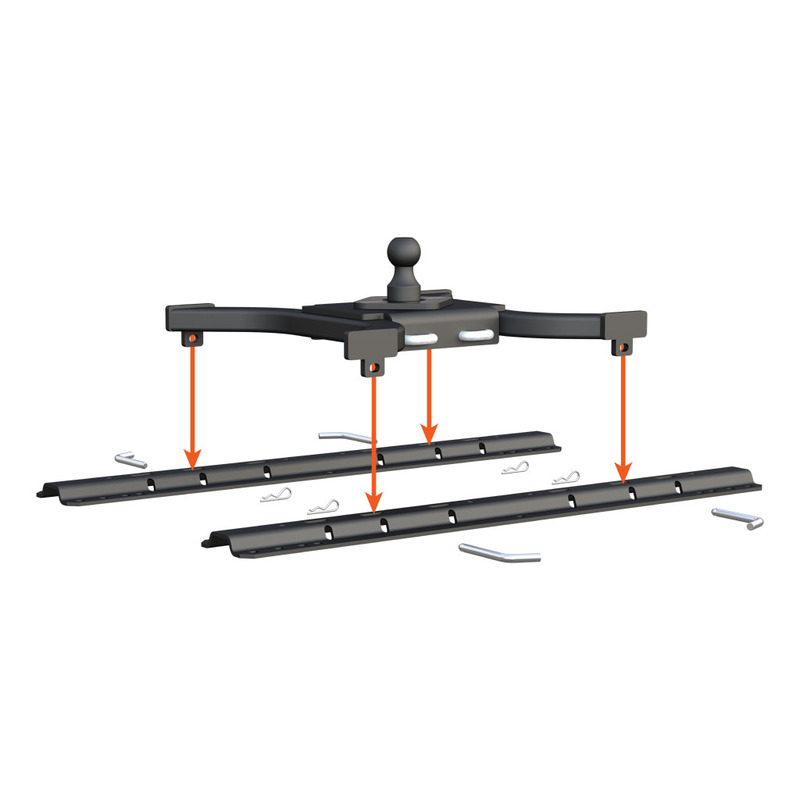 CURT fifth wheel rail gooseneck hitches easily mount into any set of industry-standard fifth wheel base rails. They use four points of attachment and provide a 2 5/16” trailer ball to accept a gooseneck trailer. These gooseneck hitches have a towing capacity of up to 25,000 lbs. and a tongue weight capacity of 6,250 lbs. They are excellent for hauling most gooseneck trailers such as livestock trailers, industrial equipment haulers, flatbeds, farm equipment and more (limited to lowest rated towing component). CURT fifth wheel rail gooseneck hitches are finished in a highly durable carbide black powder coat to give them a strong defense against scratches, UV damage and rust.